These are made exactly a third the width of a standard box so they can be used in conjunction with full width equipment. All woodwork is knot free untreated 19mm timber. 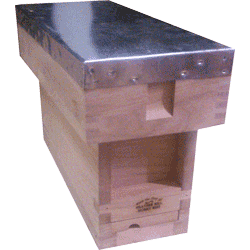 Varroa Mesh Floor including 2 way entrance block, second entrance with door and sliding inspection tray - the second entrance can be used when 3 hives are placed together so all 3 hives can have a different entrance direction.